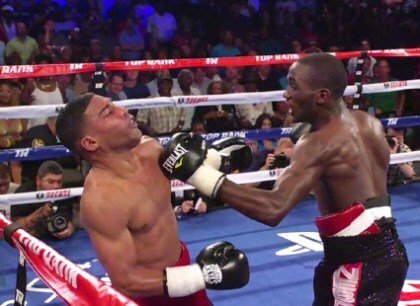 WBO light welterweight champion, Terence Crawford (28-0, 18ko) has insisted he isn’t looking past Dierry Jean (29-1) this Saturday night in Omaha, but is looking forward to victory propelling him towards the big fights regardless; Manny Pacquiao chief among them. The maiden defence of the title Crawford won against Thomas Dulorme last time out in April is expected to be a relatively routine piece of business for the man voted 2014’s ‘Fighter of the Year,’ and talk has already begun about him moving up in weight once again, this time to 147 lbs. Crawford however, remains cautiously optimistic and is insistent he is only focused on the job in hand on Saturday. “Dierry Jean is a good fighter. I am not overlooking him,” he said. “There is a lot at stake for both of us. One of the secrets to my success has been to never look past an opponent or train less than 110 percent for a fight. It’s all about focus and keeping the blinders on. “If you don’t respect the talents of the man in the opposite corner then you’re asking for trouble,” he added. It remains unclear whether Pacquiao will box on, having recently been linked to a fight with Britain’s Amir Khan that quickly went by the wayside, although Top Rank’s Bob Arum – who also looks after Crawford – is sure to be keen on a match between his two stars becoming a reality before the Filipino star re-emerges himself in his political career next May and ostensibly retires for good. “I’m ready for Manny. I’m ready for whatever lies in my future,” Crawford said. “That will be a big fight. It’s a fight we want, a fight we look forward to take my career to the next level and becoming a pay-per-view attraction. “That’s [Pacquiao] the fight we need right now. I think I just need to win Saturday, just fight my fight,” he added.